File Name: James Longstreet Flagg III of Alexandria, Virginia. Notes: Alexandria is just south of Salvo's hometown of Arlington, across the Potomac River from Washington, D.C. As referenced on filecards, this character is the son of the General Flagg who appeared in several early issues of Marvel's G.I. Joe comic series. The father was killed by Major Bludd in issue #19. To my knowledge, this Gen. Flagg was never animated, although an unrelated character by that name appeared in Sunbow's first animated miniseries. Accessories: black "short-stock M-21 automatic combat rifle" resembling M231 (new), light green bomb catapult with rubber band and black lever (new), large black missile with two fins and notch for catapult (new), brown officer's cap (new), black figure stand (common). He's the son of the original G.I. Joe Commanding General (after whom the U.S.S. Flagg aircraft carrier was named). GENERAL FLAGG is a graduate of the Virginia Military Institute, as were five preceding generations of Flaggs. 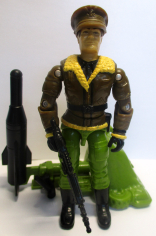 Carrying on where his father left off, General Flagg likes to be in the thick of it, meaning he needs a personal weapon as devastating as the G.I. Joe Brawler. Motto: "Don't just take the high ground, take it all!" Toy Notes: Item #6739. In the 1992 insert catalog, concept art appears instead of the actual figure. Photos exist of a prototype green cap; no carded examples have surfaced. Accessories: black rifle (92 Gen. Flagg's), light green catapult with black lever (92 Gen. Flagg's), black missile (92 Gen. Flagg's), brown officer's cap (92 Gen. Flagg's), black figure stand (common). He's the son of the original G.I. Joe commanding general (after whom the U.S.S. Flagg aircraft carrier was named). GENERAL FLAGG is a graduate of the Virginia Military Institute, as were five preceding generations of Flaggs. General Flagg shares DUKE's philosophy of personally leading his troops into a firefight, instead of sending out orders from behind the lines in some cozy commander's tent. When the call is given to charge, he's the one shouting it from the front. His strategies on the battlefield have twice earned him the Medal of Valor and countless decorations as he carries on his family's proud military tradition. Motto: "I didn't reach the rank of general by staying in the shadows, I got out and earned it on the front lines!" 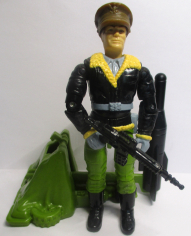 Accessories: black pistol (86 Lifeline's), black rifle (03 Recondo's), green officer's cap with gold eagle on front (new). 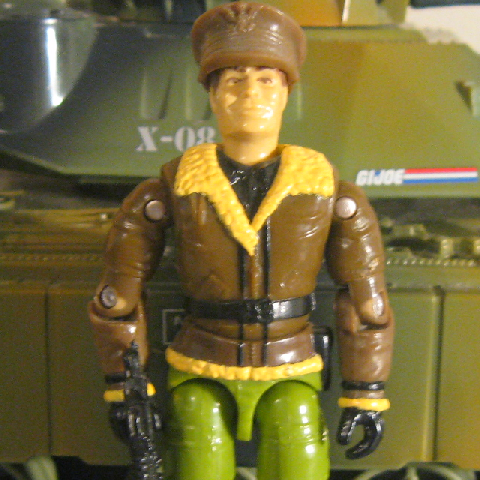 GENERAL FLAGG is the son of the original G.I. JOE Team commanding general. He is a graduate of the Virginia Military Institute, as were five preceding generations of Flaggs. GENERAL FLAGG shares the same philosophy as DUKE of personally leading his troops into a firefight instead of sending out orders from behind the lines in some cozy commander's tent. When the call is given to charge, he's the one shouting it from the front. His strategies on the battlefield have twice earned him the Medal of Valor and countless decorations as he carries on his family's proud military tradition. "I didn't reach the rank of general by staying in the shadows. I got out and earned it on the front lines." Toy Notes: Carded in a three-pack with Steeler, Cobra Officer, and a reprint of Marvel #5. Item #60498. Note that the filecard actually describes the son of the character depicted in the comic, while the figure better represents the comic character himself.